Spring & Summer 2019 Camps and Workshops for adults, teens, and kids are now posted in my teaching calendar on right hand sidebar. Check it out now, as some have already filled. See you soon! “[Sequencing] helped me a great deal… Also helped with my pottery design.”~ Mary S.
Treat yourself or a friend to creative time in a relaxed, supportive atmosphere. Gift cards can also be used for purchasing Kristen's artwork, cards, and prints. “Will you let me know if you're teaching any more intuitive painting classes? I am deeply enjoying your presence and your ways of exploration. Sad that the six weeks are almost through. xo.” ~ Toni M.
“I'm so excited to be in your class…you are such an inspiration to me!” ~ Keri H.
I teach a range of art classes and camps at local venues. You can find current and upcoming classes on the interactive events calendar to the right. Click on a date or event to learn more and to register. "Thank you so much Kristen for a very informative and well thought out class. I am now more comfortable using my camera and editing the photos I take. You have inspired me to go out and take more photos"~ Pat D.
Have you always wanted to try painting or mixed media work? Have you painted in the past but you're feeling "rusty" or timid - this is a great option for you. Explore and create in my home studio, a relaxed, nurturing environment. Paint with acrylic, or liquid watercolor, gouache (highly pigmented watercolor), oil and soft pastels. Try collage and small sculpting projects with fabric, paper, wood, metal, glass, and other mixed media. The possibilities are endless! Bring your own mixed media materials or use some of mine. 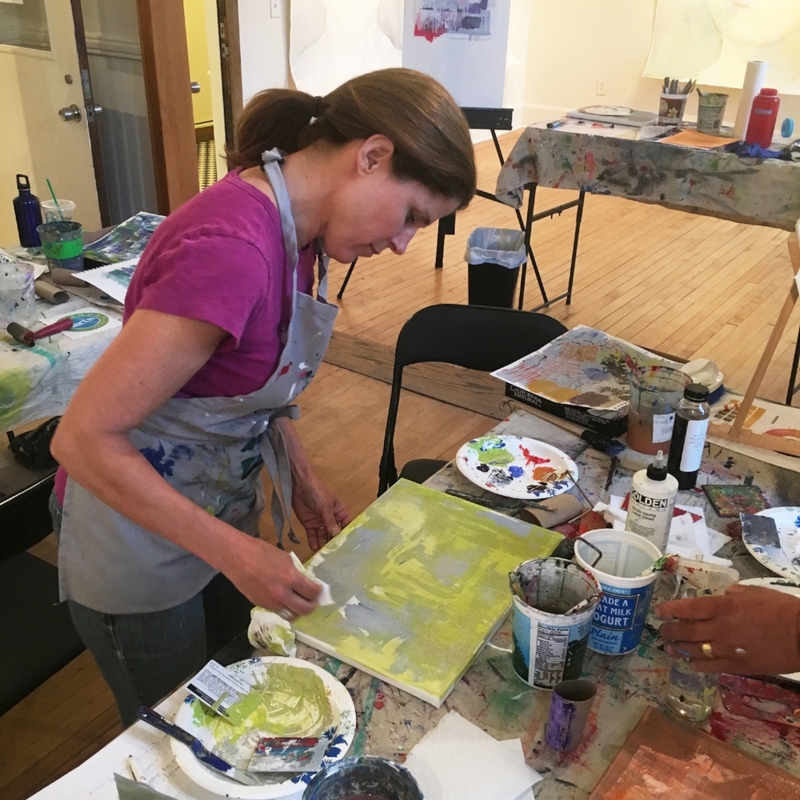 Select subjects of your choice & receive individualized technique tips, encouragement & support to begin your painting adventure. Complete beginners are encouraged! All basic materials included (paint, paper, up to two canvasses, and brushes). “Thanks so much for sharing your inspiration, encouragement, and knowledge. I appreciate your hard work, the enthusiasm is contagious.” ~ Debbie G.
“I thought your class was super. Very challenging for someone who hasn’t yet learned the art of cutting loose, but you gave so much permission and just the right amount of structure and instruction. I feel like I learned so much... Thank you for the very positive experience” ~ Diane L.
Artist Open Studio is available as a single 2 hour session by appointment. Fee: $40. You can also purchase 6 session punch cards for $220 ($20 savings) and 3 session punch cards for $110 ($10 savings). Developing basic to advanced skills in painting (acrylic, oil, watercolor), drawing (pencil, charcoal, pastel, ink), art bookmaking/altered books, assemblage/sculpture, and digital photography in a supportive, student-directed, atmosphere where the goal is rigorous exploration, practice, and enjoyment. I can meet with you at my home studio in Burlington, VT, or at your home at a time that's convenient for you. Instruction Fee: $60 for 1.5 hour session for one person. Two students (Mom or Dad and child, couples, friends) costs $80 and three students costs $100. Transport fee: $15 per session (for drive time, set up and tear down outside my studio). I provide the non-consumable tools as needed (brushes, easels, and other items). why should I consider this when I can just take a class? Private or small group instruction is flexible, designed to fit your schedule. You'll be in a place you choose, somewhere comfortable, with no parking hassles and no schlepping supplies to and from class. It's all right there for you. You'll learn and practice with a group of people you know. Instruction is customized and personalized to your goals, your pace, and your skill set. You get more for learning, more practice, more value for your money. I hold degrees in studio art, and work as a teaching artist both in and outside the school setting. I hold a VT license in Art Education for PreK-12 with Highly Qualified Teacher status. To learn more connect with me here.